Chinaworker.info – Free Wu Guijun! Free Guangzhou 12! Free Wu Guijun! Free Guangzhou 12! A chorus of protests grows louder over the extra-legal detention of Shenzhen workers’ representative Wu Guijun, arrested and detained for over 130 days, following a labour dispute in May, and the detention of 12 Guangzhou hospital workers following a protest action in August. Wu and his fellow workers, at the Diweixin Product Factory in Shenzhen’s Baoan district, took strike action to demand compensation and back pay, as the Hong Kong-owned company shifted production from Shenzhen to Huizhou. The mass arrests and detentions in these two separate cases highlight the continuing harsh treatment of workers in China, but also a marked upturn in state repression. With the economic slowdown, instances of company closures, relocations, wage arrears and greater use of agency labour, are increasing across the country. Strikes and labour disputes are becoming longer, more organised, and more often recur at the same workplace – trends that seems to have brought forth the new tougher response from the authorities. “The case of Wu Guijin shows a disturbing new level of repression against workers fighting for their rights,” said Zhang Shujie, a labour activist and contributor to chinaworker.info. “It is a warning sign that this is happening in Guangdong province, where the ACFTU (official trade union) branches promote themselves as being ‘more pro-active’ – in words at least they support collective bargaining and direct workplace elections for union representatives,” he said. To date, the local organs of the ACFTU, China’s state-controlled and only legal union body, have refused to act or make public comment on the case of Wu Guijun or the detained hospital workers in Guangzhou. Since his detention on 23 May, Wu has been refused access to a lawyer or his family, in violation of his legal rights. Supporters fear he is likely to be charged with “assembling a crowd to disturb public order” – which risks a sentence of three to seven years in prison. According to the IHLO in Hong Kong, Wu’s lawyer has not been given any written information on the case and an application for bail was refused with no reason being giving. In May, around 300 workers at the Diweixin factory in Shenzhen staged a strike and sit-in, in a month-long dispute over severance and back pay. As negotiations with the company dragged on, with its offer to the workforce far short of the legal minimum, the workers turned to the local government to support them. A march to present a petition to the Shiyan district government offices, involving around 200 workers, was arrested by riot police on 23 May. Around 100 of the arrested workers were released the next day, but 59 were held for ten days. Following the arrests the company sacked all the workers’ representatives and broke off negotiations. 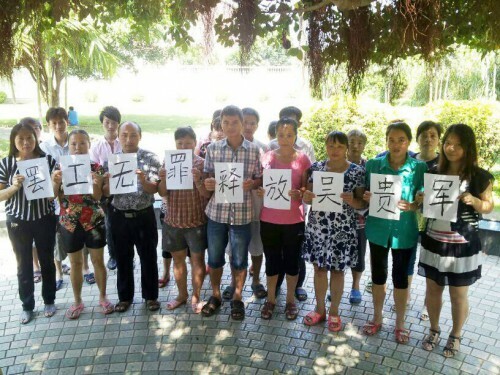 On 29 June, two of the remaining workers’ representatives were released from detention, while Wu is still being held. Under China’s laws, the security agencies are allowed to hold someone under administrative detention for fifteen days without a court order, after which time they must file for an official arrest permit. None of this has happened in Wu’s case, underlining the illegal nature of his detention. Meanwhile, in the provincial capital of Guangzhou, 12 security guards employed as agency workers at the First Hospital of Guangzhou University of Chinese Medicine were arrested after staging a rooftop protest on 20 August and placed in criminal detention for “assembling a crowed to disturb public order”. Their action was part of a wider struggle spanning many months, including a marathon sit-in outside the hospital in mid-May, by around 200 health workers employed by various labour agencies who face inferior pay and conditions compared to the hospital’s permanent staff. May of these workers had worked for nearly 20 years at the hospital, which is also a major shareholder in several of these labour agencies. There have been protests from unionists in Hong Kong and elsewhere to demand the release of Wu Guijun and the Guangzhou workers, and to support demands for workers’ basic rights to be met. On 1 October, proclaimed “a National Day of Anger” by a union spokesperson, the Hong Kong Confederation of Trade Unions (HKCTU) organised a protest march to the offices of the central government to call for the release of the imprisoned workers. chinaworker.info is appealing to labour movement activists and organisations around the world to add your voice to these protests. Send this protest letter (below in both English and Chinese) by email. The Chinese authorities and official unions should be besieged by protests in coming days. We are deeply concerned over the extra-legal detention of Wu Guijun, an elected workers’ representative at the Diweixin Product Factory in Shenzhen, who has been held by public security officials since 23 May. Mr Wu was arrested during a march by workers to petition district government officials in Shiyan, to seek their support against a company that has refused to act in accordance with China’s labour laws in respect of severance pay and wage arrears. In a further alarming development, 12 security guards at the First Hospital of Guangzhou University of Chinese Medicine have been held in detention since August following a protest against the employers’ refusal to buy social insurance. These cases represent an attack on workers’ basic rights. We urge the immediate release of these workers from detention. Protest! Free Wu Guijun! Free Guangzhou 12!